Beneath the nondescript facade of the Mun San Fook Tuck Chee lies a rich history hailing back to the early industrial age of 19th century Kallang. 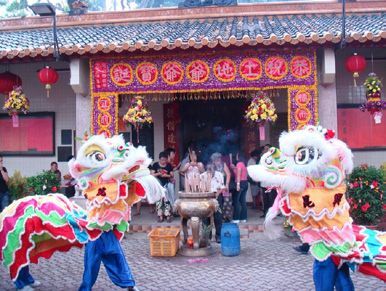 More recently, this temple drew public attention on 26 January, when it was reported its temporary occupation licence will run out in June this year (http://shar.es/QZ6qh). A gathering place in its early years for Cantonese and Hakka coolies from nearby brickworks and other workshops, it was also the communal centre of the old Sar Kong village of Lor 17 Geylang. Today, despite dramatic changes in the surroundings, the temple’s fire dragon still parades around the HDB estate it is part of during the feast day of its patron deity, “Tai Pak Kung” or the God of the Earth.Join us for stories of coolies and the bricks they made painstakingly by hand, hear about Cantonese deities and lost traditions, and listen to the peal of the temple bell aswe explore this old temple and its neighbourhood. An engineer by profession, Yik Han devotes much of his free time to heritage pursuits. He is a coauthor of the book A Boon Returned: The History of Mun San Fook Tuck Chee.